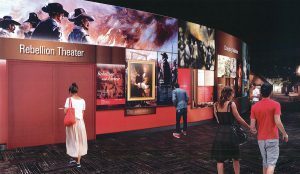 Jamestown Settlement is undergoing a large-scale, phased renovation to sections of its 30,000-square-foot permanent exhibition galleries to serve as a national stage for the 2019 Commemoration. 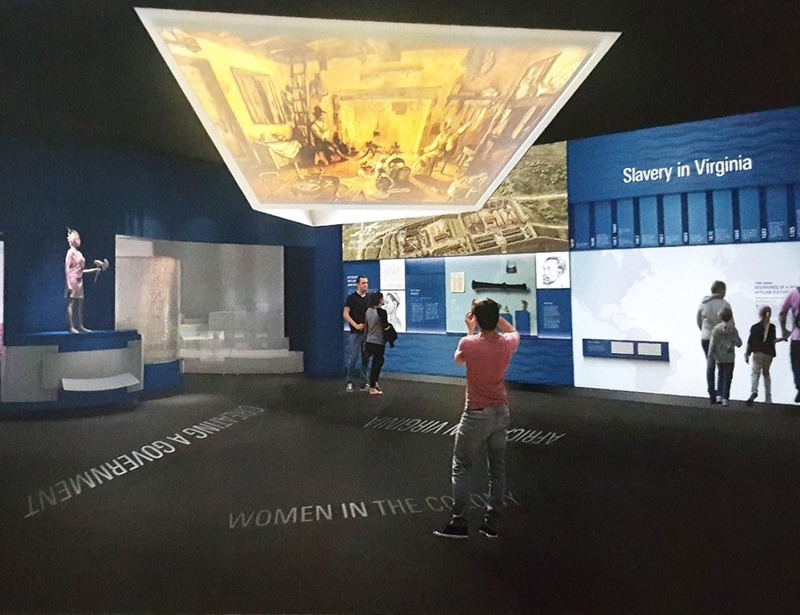 The $10.6 million exhibition gallery refresh is incorporating new historical research and technology to present historical events to visitors in innovative ways, including interactive touch screens, immersive exhibits and a new multimedia experiential theater. New exhibits and the new theater will open in stages in 2019. Jamestown Settlement is a year-round stage for the 2019 Commemoration, American Evolution, with a new gallery to expand on historical events marking 400-year milestones, such as the first legislative assembly in the New World, the first recorded Africans in Virginia, and the influx of English women to the Virginia colony, all which occurred in 1619. The galleries, which debuted on the eve of America’s 400th Anniversary commemoration in 2007, explore the Powhatan Indian, English and Angolan cultures that converged in Virginia in the 1600s through artifact-filled cases, dioramas and short films. The first phase of gallery work, completed in Spring 2017 for $2 million, added an interactive technology wall to compare and contrast each culture’s language, religion, government, economy, family structure, recreation and art, as well as projected personal stories on monitors and life-size screens. 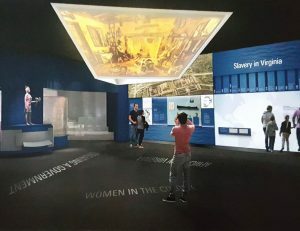 The project is being funded by a public-private partnership by the Commonwealth of Virginia and private gifts to the Jamestown-Yorktown Foundation, Inc. The story of “Bacon’s Rebellion” – a 1676 armed rebellion of Virginia colonists led by Nathaniel Bacon against the rule of governor William Berkeley – will unfold across multimedia screens in a 124-seat Rebellion Theater. Similar to the American Revolution Museum at Yorktown’s Siege of Yorktown Theater, visitors will experience the story through multi-sensory special effects and will smell smoke and gunfire, feel arrows fly, feel the heat from the fire burning Jamestown, and hear the sound of a swarm of files seen as an omen before the rebellion. In the existing “From Africa to Virginia” theater, three-dimensional panels will be added along with new information about the arrival of the first recorded Africans in 1619 and the growth of slavery through 1699, when Virginia’s capital moved inland to Williamsburg. Exhibits also will include new research about Powhatan’s capital at Werowocomoco and Pocahontas. Werowocomoco, as well as archaeological findings at Powhatan’s capital, was the focus of a Jamestown Settlement special exhibition in 2010. DLR Architects of Washington, D.C., is lead architect. Gallagher & Associates of Silver Spring, Md., is exhibit designer. Cortina Productions of McLean, Va., is producing the films and interactives in the exhibition galleries.